A union jack red, white & blue flag badge with a black & white oval design and the GB initials. 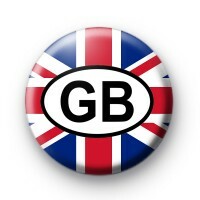 Great Britain button badge. Standard 25mm button badge hand made in our UK workshop from metal badge components, with a plastic coated printed design & copper D pin back.